“Little Antonia is reputed to have helped her uncle, Henry Draper, in his laboratory by handing him the test tube he asked for in his chemical experiments,” wrote astronomer and historian Dorritt Hoffleit. On her mother’s side, her cousin Commander Matthew Fontaine Maury became the first director of the United States Naval Observatory. It seemed almost inevitable that all three of the Maury siblings would go on to careers in science, undaunted by the fact that two of them were women in the late 19th century. John William Maury, named for his grandfather, became a physician and surgeon. Carlotta Maury, the most grounded of the three, became a geologist and paleontologist. And Antonia Maury became an astronomer. But if her remarkably scientific family helped shape her trajectory in life, Maury also found herself largely in the shadow of the famous men around her. The crater on the Moon that now bears her name was originally named for her cousin Matthew, and today they technically share the honor. When she took her first job after graduating from Vassar College in 1887, she went to work at Harvard College Observatory on a catalog of stars intended to honor her late uncle Henry Draper. And like all of her female colleages at the observatory, Maury worked under the aegis of the observtory’s director, Edward Charles Pickering. Fresh out of college, Maury became one of the Harvard Computers, a group of women who analyzed and cataloged the data from the Observatory’s telescopes. 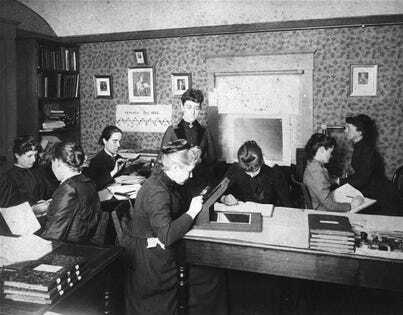 At the time, the women — several of whom held graduate degrees in astronomy and physics — weren’t allowed access to the telescopes for their own observations, but they spent their days poring over photographs, stellar spectra, and other data about the stars — and you can’t hand a roomful of briliant women stacks and stacks of data without expecting them to make some fantastic discoveries. Maury worked alongside the likes of Henrietta Leavitt, whose work with variable stars gave astronomers their first tool for calculating the distance to other galaxies; Cecilia Payne, who discovered that the Sun is mostly made of hydrogen; and Annie Jump Cannon, who helped develop the system astronomers now use to classify stars. Maury went on to contribute to that classification system as well, and she also published the first catalog of stellar spectra — bands of light, broken up into their constituent wavelengths, that reveal the chemical makeup of a star. But it almost didn’t happen. The Harvard Computers worked in the shadow of Pickering’s ego and turn-of-the-century sexism. Despite their qualifications and their work, most of them received only 25 to 50 cents an hour — about what a clerical worker of the day could expect, and about half the pay of male scientists doing similar work. That’s why Pickering hired women for his lab, in fact; they were a much cheaper source of labor. Even so, the Harvard Computers provided one of the best jobs a female astronomer could hope for in the late 1800s. That was true even though each woman in the lab knew that Pickering would publish most of their work under his own name. At an 1890 meeting about the progress of the Draper Memorial Project, Pickering presented results under his own name, mentioning only in passing that “a careful study of the results has been made by Miss A.C. Maury, a niece of Dr. Draper.” Most of the work, of course, had been Maury’s. Things came to a head in 1891, when Pickering vocally disagreed with how Maury had classified the stars in her portion of the catalog (an approach which formed the basis of the system astronomers still use today). Maury noticed that some stars in the catalog were much brighter than other stars of the same color. She sorted those brighter stars into a different category from their less-luminous brethren, even if they seemed to have similar spectra. (Cannon didn’t make that distinction in her part of the catalog, but she did include notes about the differences in luminosity.) But Pickering and another Harvard Computer, astronomer Willamina Fleming, had developed their own classifcation system which didn’t bother sorting by luminosity — and he disliked being challenged. “Pickering, miffed that she had set up an independent classification system of her own rather than blindly accepting the Pickering-Fleming system, steadfastly maintained that the spectra she examined were not of good enough quality to reveal such distinctions!” wrote Hoffleit. Fed up with the conflict and the lack of credit for her own work, Maury left Harvard to take a teaching position. Pickering asked her to return, but it took until 1893 to convince her — and then she only came back for a brief stint, long enough to finish the catalog of northern stars, whose title page listed the work as “Discussed by Antonia C. Maury under the direction of Edward Charles Pickering, making it the first star catalog ever published under a woman’s name, and the first published catalog of stellar spectra. . By the time it was published in 1897, Maury was gone again, teaching chemistry at a girls’ school in New York. Maury was still teaching chemistry when astronomer Einjar Hertzpsrung, working on his own star classifiction project in 1905, noticed the same thing she had: some stars had very similar colors but very different brightness. When he found that Maury had accounted for that in her catalog, he used it as a reference for his work — which eventually became the Hertzsprung-Russell diagram, a system for classifying stars which plots their brightness on the Y-axis of a graph and their color on the X-axis. Can you find our Sun’s position on the diagram? But Maury couldn’t stay away from astronomy forever. It was, after all, in her blood. She returned to the Harvard College Observatory in 1918, this time as an adjunct professor. Thanks to a combination of the Observatory’s new director, Harlow Shapley, and the beginnings of a gradual shift in attitudes toward women in science, this phase of Maury’s career was notably different: her work began to be published unequivocally under her own name — including her discovery of the first binary star ever identified by looking at its spectrum, Mizon A in the constellation Ursa Major. She remained at the observatory for 30 years until her retirement in 1948.